Living paycheck to paycheck is not just a problem for lower-income workers. 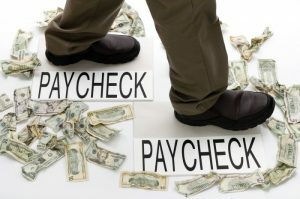 Studies have found that many high earners are also finding themselves trapped in the living paycheck to paycheck financial cycle. A recent survey by SunTrust found that almost one-third of survey respondents making $75,000 per year or more are living paycheck to paycheck on occasion. The same survey found that nearly one-fourth of the respondents making over $100,000 annually do as well. The SunTrust survey polled 518 adult respondents in households with a combined income of $75,000 or higher. One of the biggest culprits for this trend in living paycheck to paycheck is lifestyle inflation. Many people that receive a raise, a bonus, or some other type of increase in their income begin to spend more money instead of maintaining their current lifestyle and saving the additional money. For example, 68 percent of the survey respondents that acknowledged they were not saving as much money as they should cited expenses from dining out as the main reason for their lack of saving. Entertainment and clothing expenses came in close behind. This shows that their discretionary spending is out of control, not that they are not making enough money to meet their necessary expenses. So how do you break the living paycheck to paycheck cycle? The first step is to figure out where your money is going each month. Establishing a budget and tracking your expenses will show you what you are spending your money on each month and how much you are spending in each category. If this sounds like a lot of work, it can be if you do it by hand in notebooks or on sheets of paper. Fortunately, there are a number of free apps that will link to your bank and credit accounts to log your transactions and categorize them into easily viewed budget categories. A favorite app for this task is Mint. The next step is to reduce your spending to a more manageable level that allows you to have money left over for saving. This could mean limiting dinners out to once or twice a week and cooking the rest of the time, getting rid of memberships and subscriptions that you do not need, establishing a set amount for entertainment each month, or getting rid of the premium packages on your cable bill. Most people have many areas of spending that could be trimmed if necessary and living paycheck to paycheck makes reductions in spending necessary.